To my mind, it is important that today too there should be no lessening of the desire for serene and constructive discussions between states. It is clear, though, that relationships within the international community, and the multilateral system as a whole, are experiencing a period of difficulty, with the resurgence of nationalistic tendencies at odds with the vocation of the international Organizations to be a setting for dialogue and encounter for all countries. This is partly due to a certain inability of the multilateral system to offer effective solutions to a number of long unresolved situations, like certain protracted conflicts, or to confront present challenges in a way satisfactory to all. It is also in part the result of the development of national policies determined more by the search for a quick partisan consensus than by the patient pursuit of the common good by providing long-term answers. It is likewise partially the outcome of the growing influence within the international Organizations of powers and interest groups that impose their own visions and ideas, sparking new forms of ideological colonization, often in disregard for the identity, dignity and sensitivities of peoples. In part too, it is a consequence of the reaction in some parts of the world to a globalization that has in some respects developed in too rapid and disorderly a manner, resulting in a tension between globalization and local realities. The global dimension has to be considered without ever losing sight of the local. As a reaction to a “spherical” notion of globalization, one that levels differences and smooths out particularities, it is easy for forms of nationalism to reemerge. Yet globalization can prove promising to the extent that it can be “polyhedric”, favouring a positive interplay between the identity of individual peoples and countries and globalization itself, in accordance with the principle that the whole is greater than the part. In light of this concern, I chose to devote my Message for this year’s World Day of Peace, celebrated on 1 January, to the theme: Good Politics at the Service of Peace. There is a close relationship between good politics and the peaceful coexistence of peoples and nations. Peace is never a partial good, but one that embraces the entire human race. Hence an essential aspect of good politics is the pursuit of the common good of all, insofar as it is “the good of all people and of the whole person” and a condition of society that enables all individuals and the community as a whole to achieve their proper material and spiritual well-being. Politics must be farsighted and not limited to seeking short-term solutions. A good politician should not occupy spaces but initiate processes; he or she is called to make unity prevail over conflict, based on “solidarity in its deepest and most challenging sense”. Politics thus becomes “a way of making history in a life setting where conflicts, divisions and oppositions can achieve a diversified and life-giving unity”. Sadly, in these years Syria and more generally the whole Middle East have become a battleground for many conflicting interests. In addition to those of a chiefly political and military nature, we should not overlook attempts to foment hostility between Muslims and Christians. Even though “over the centuries many quarrels and dissensions have arisen between Christians and Muslims”, in different areas of the Middle East they have long lived together in peace. In the near future, I will have occasion to visit two predominantly Muslim countries, Morocco and the United Arab Emirates. These represent two important opportunities to advance interreligious dialogue and mutual understanding between the followers of both religions, in this year that marks the eight-hundredth anniversary of the historic meeting between Saint Francis of Assisi and Sultan al-Malik al-Kāmil. Among others who are vulnerable, Paul VI went on to say that: “We speak for… the younger generation of today, who are moving ahead trustfully, with every right to expect a better mankind”. Young people, who often feel bewildered and uncertain about the future, were the subject of the fifteenth Ordinary General Assembly of the Synod of Bishops. They will also be at the forefront of the Apostolic Journey that I will make to Panama in a few days for the thirty-fourth World Youth Day. Young people are our future, and the task of politics is to pave the way for the future. For this reason, it is urgently necessary to invest in initiatives that can enable coming generations to shape their future, with the possibility of finding employment, forming a family and raising children. In his address before the United Nations, Saint Paul VI clearly indicated the primary goal of that international Organization. In his words: “You are working to unite nations, to associate states… to bring them together. You are a bridge between peoples... It is enough to recall that the blood of millions, countless unheard-of sufferings, useless massacres and frightening ruins have sanctioned the agreement that unites you with an oath that ought to change the future history of the world: never again war! Never again war! It is peace, peace, that has to guide the destiny of the nations of all mankind! [And] as you well know, peace is not built merely by means of politics and a balance of power and interests. It is built with the mind, with ideas, with works of peace”. Finally, I would mention a fourth feature of multilateral diplomacy: it invites us to rethink our common destiny. Paul VI put it in these terms: “We have to get used to a new way of thinking… about man’s community life and about the pathways of history and the destinies of the world… The hour has come… to think back over our common origin, our history, our common destiny. The appeal to the moral conscience of man has never been as necessary as it is today, in an age marked by such great human progress. For the danger comes neither from progress nor from science… The real danger comes from man, who has at his disposal ever more powerful instruments that are as well fitted to bring about ruin as they are to achieve lofty conquests”. It is painful to note that not only does the arms trade seem unstoppable, but that there is in fact a widespread and growing resort to arms, on the part both of individuals and states. Of particular concern is the fact that nuclear disarmament, generally called for and partially pursued in recent decades is now yielding to the search for new and increasingly sophisticated and destructive weapons. Here I want to reiterate firmly that “we cannot fail to be genuinely concerned by the catastrophic humanitarian and environmental effects of any employment of nuclear devices. If we also take into account the risk of an accidental detonation as a result of error of any kind, the threat of their use, as well as their very possession, is to be firmly condemned. For they exist in the service of a mentality of fear that affects not only the parties in conflict but the entire human race. International relations cannot be held captive to military force, mutual intimidation, and the parading of stockpiles of arms. Weapons of mass destruction, particularly nuclear weapons, create nothing but a false sense of security. They cannot constitute the basis for peaceful coexistence between members of the human family, which must rather be inspired by an ethics of solidarity”. Finally, I would like to mention yet another anniversary. On 11 February ninety years ago, the Vatican City State came into being as a result of the signing of the Lateran Pacts between the Holy See and Italy. This concluded the lengthy period of the “Roman Question” that followed the taking of Rome and the end of the Papal States. With the Lateran Treaty, the Holy See was able to have at its use “that small portion of material territory indispensable for the exercise of the spiritual power entrusted to men for the sake of mankind”, as Pius XI stated. 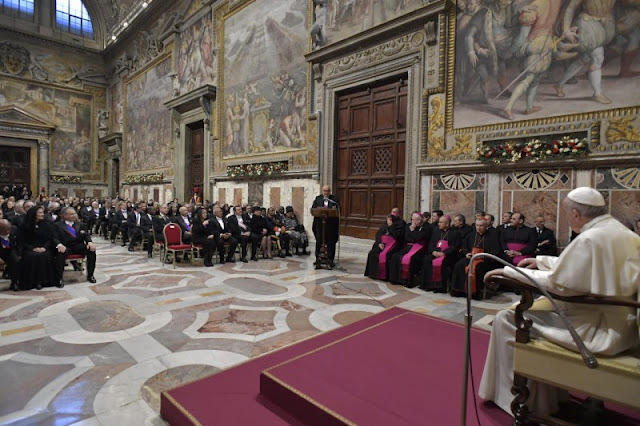 With the Concordat, the Church was once more able to contribute fully to the spiritual and material growth of Rome and Italy as a whole, a country rich in history, art and culture, which Christianity had contributed to building. On this anniversary, I assure the Italian people of a special prayer, so that, in fidelity to their proper traditions, they may keep alive the spirit of fraternal solidarity that has long distinguished them.